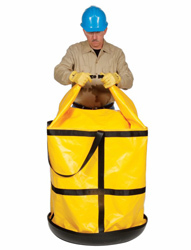 The PIG Drum Containment Bag is UN-rated for solid hazardous materials shipments and helps facilities comply with shipping and storage regulations. It features 6,000 pound capacity lifting straps that support a fully loaded 55-gallon drum. Its puncture-resistant, PVC-coated shell clips shut to keep rainwater out and an abrasion-resistant bottom provides enough toughness to be dragged across gravel and other rough surfaces. A removable poly liner contains leaks and drips inside of the bag and can be cleaned and re-used, saving money and minimizing waste.